The Foton View cargo van is the 4th generation of Foton vans with a great design and perfect combination of performance and comfort. Featuring leading technologies such as a Cummins engine, the vehicle provides customers with great value, high efficiency, a fantastic driving experience and, of course, loads of space for whatever cargo you need to move. The View cargo van has a powerful 96kW Cummins ISF 2.8 litre diesel engine with a torque output of 280 N.m (maximum). This is 22.5% – 60% higher than similar products. The View is built to effortlessly handle a heavy load while maintaining control and stability. The View features a BOSCH electronic, high-pressure common rail fuel injection system, ensuring the best performance. 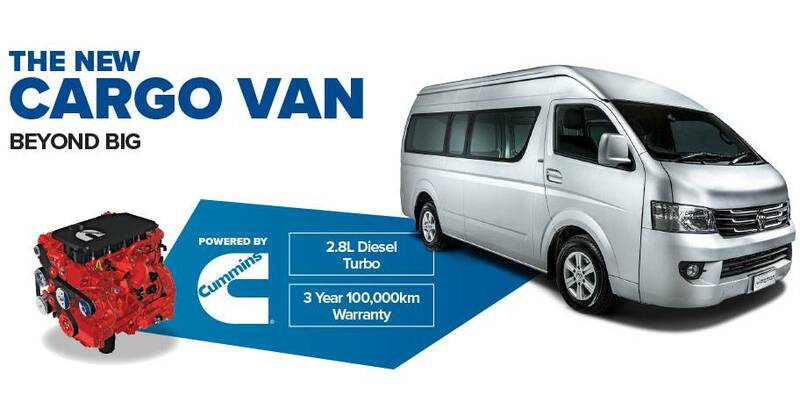 The View cargo van comes with alloy wheels, reverse sensors, dual air bags and a 100,000kms/3 year warranty.